Ogden on Politics: No, Virginia, President Obama Never Won in a "Landslide"
No, Virginia, President Obama Never Won in a "Landslide"
A friend of mine the other day remarked that President Obama won re-election in a landslide in 2012. I had extensively researched the issue previously and today I found my research. As I thought, Obama did not win re-election in a "landslide." Not even close. Nor did he win his first election in a landslide. After the election debacle of 1800, there was major change to the Electoral College in the Constitution.. Thus my research starts with 1804 and the modern version of the Electoral College. There have been 53 presidential elections between 1804 and 2012. While I have electoral college results for all those races, the popular vote was not kept until 1824. So popular vote totals are compared on the basis of 48 races, from 1824 to 2012. 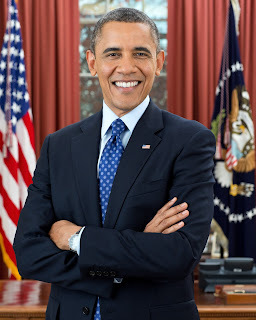 In 2012, President Obama won re-election against Republican Mitt Romney with 50.96% of the popular vote and won 332 of the 538 electoral vote. The popular vote spread in that race was 13th closest (out of 48) since 1804 and the electoral college margin was the 17th closest (out of 53). So not only was it not a landslide from either a popular vote or electoral vote standpoint, it was actually an historically close election. For the record, the closest popular vote margin was the 1880 race featuring Democrat Winfield Scott Hancock and Republican James Garfield, a race Garfield won. The closest electoral college race was in 1876 and involved Democrat Samuel Tilden And Rutherford B. Hayes. That race featured electoral college deal in which Democrats agreed to propel Hayes to the presidency in exchange for the Republicans withdrawing troops which were in the South enforcing Reconstruction following the Civil War. The biggest landslides? On the popular vote side that would be Republican Warren Harding's victory with 60.32% of the vote in 1920. His opponent, Democrat James P. Cox, only managed 34.15% of the vote. As far as the Electoral College, the biggest landslide was Democrat Franklin Roosevelt's victory over Republican Kansas Governor Alf Landon, The second biggest electoral college landslide was Republican Ronald Reagan's victory over Democrat Vice President Walter Monday. Reagan captured 95.2% of the electoral vote compared to the 97% of that vote garnered by FDR. Correction: The original article had Obama winning 332 electoral votes in 2008 and 2012. This was a mistake. He won 365 electoral votes in 2008 and 332 in 2012. The rankings were based on the correct 365 total and did not change. Actually, your mention of the Tilden-Hayes election brought a question to mind which perhaps you can answer, Paul: Who administered elections in the occupied States during Reconstruction? Not sure if it was the US Army or the local govt. The federal government ran elections in the states of the Old Confederacy during Reconstruction. Blacks were registered and allowed to vote. (The exact mechanism for doing so, I'm not certain. Probably had to be local people doing it though at the point of the federal bayonet.) Scores of African-Americans voted (Republican) and several black candidates were elected to office during this period. When the federal troops withdrew after the Tilden-Hayes election, the state and local authorities began enacting all kinds of obstacles - things like the white (Democratic) Primary, literacy and understanding the constitution tests, grandfather clauses, etc.) They would also shut down registration offices if blacks came to register. They were so effective at shutting down black participation in politics that a community like Selma only had 1% of blacks registered to vote even though the city was more than 50% black. Got it...the white Democratic regimes of the times were the "Redeemers," if I'm correct. After Lincoln was murdered the power of the Republicans was greatly increased and they acted like Republicans in Indiana when given a super majority....e.g. they were stupid. 94% of Southerners owned no slaves (in case you never learned any correct history). You will recall, of course, that "...the bond-man's ...unrequited toil was piled up in ALL PARTS of the country." So, the dopes decided to nation build in the South(sound a bit familiar? ), turned it over to harsh capitalists to steal the wealth of the country, gerrymandered politics to have larger Republican offices in Congress, put carpet bagging negroes in charge and gave punitive powers. Tried, in other words to make the South into Detroit, or Chicago, or Gary, or Hammond, or Indianapolis. Thus, of course, was born the KKK which resisted the dumb Republicans, and became the terrorist arm of the Democrat Party. And Planned Parenthood was cleared of the things you claimed. Still waiting for that correction. No PP, which consists of hundreds of chapters throughout the United States, was most certainly never "cleared of the things you claimed." Some clinics sold fetal body parts, some did not. Nobody ever said they all did that. Plus, PP officials freely admitted that some of the people who work at clinics reposition the fetus during the abortion to better procure intact body parts. It is a felony to do that. PP is and remains a reprehensible organization that taxpayers should not be spending a dime on.